Love Mom’s Pot Roast but forgot to take notes when she was making it? Search no more! Here’s a foolproof recipe for the most tender, juicy and flavorful pot roast you’ve ever had…just like Mom’s. A pot roast is not a particular cut of meat. It’s a braised cut of any meat, simmered with seasonings and aromatics. Believe it or not, the tougher cuts of meat work best! 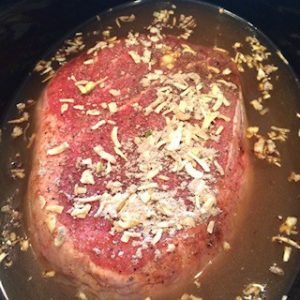 What Cut of Beef Do I Use for Mom’s Pot Roast? You can see from the image below that chuck is on the upper portion of the cow, as are the rib, sirloins and rump. The chuck, rump, round and brisket are less tender than the center parts (ribs and loins) because they are used in movement, thus more muscular. When any of these cuts is braised at a low temperature for a long time, the results are fabulous! However, both chuck and rump cuts produce an amazingly tender and flavorful pot roast. Chuck cuts might be labeled as chuck roast, boneless chuck roast, 7-bone chuck roast, 7-bone-in roast, shoulder steak, chuck shoulder pot roast, or beef chuck arm. Brisket is a leaner, flat cut. Cuts might indicate “brisket point” which is usually fattier and often used for corned beef or barbecue recipes. Round rump roast or bottom round cuts are both relatively tough cuts and make beautifully delicious pot roasts. What Type of Liquid Should I Use to Braise the Pot Roast? A braising liquid can be water, stock or broth. Typically, beef broth is used with a few cloves or garlic or onions added to the broth. What Is the Best Way to Cook a Pot Roast? A pot roast can be cooked in the oven in a roasting pan or in a slow-cooker. If you use a roasting pan, ensure the lid fits securely. The secret to a perfectly cooked roast is cooking it low and slow–keeping all the juices in tact. If the lid doesn’t fit securely, steam will escape, as will the braising liquid. If your roasting pan doesn’t have a lid, place a large piece of heavy-duty aluminum foil over the top (allow about an inch of extra foil around the edges); then curl and fold the excess foil over the top lip of the roasting pan, creating a tight lid. This same technique can be applied to a slow cooker if you’re lid is cracked or missing. How Do I Season a Pot Roast? Generally, salt, pepper, and maybe a little garlic powder are the only seasonings applied to the meat. If you want a more developed seasoning, add a little to the meat and to the broth. For instance, if you want a hint of oregano in your pot roast, apply a little oregano to the whole roast and the liquid as well. This recipe uses a packaged dry onion soup mix as shown above, which gives a very savory, hearty flavor to the roast and vegetables. What Vegetables Should I Add to Mom’s Pot Roast? You can never go wrong with adding onions, carrots and potatoes! Quarter a large onion or two and add it to the roasting pan or slow cooker with the roast and liquid. If you want to add carrots and potatoes, simply peel and cube either Russet or Yukon Gold potatoes, peel and chop carrots, and add both halfway through the cooking process. If you want to add sliced yellow or zucchini squash, add them about an hour before the roast is done. Do I Need to Sear the Roast Before Cooking? If you are running short on time, you might want to sear the roast in a heavy-bottom skillet before placing it in the braising liquid. In a slow cooker, a pot roast usually takes between 6-8 hours; of course, it depends upon the size, but most 2-4 lb. roasts take all day to cook. If you’re cooking a pot roast in the oven in a roasting pan, it will take about the same amount of time; however, if you’re short on time you can sear the roast first, then place it in the oven (with a lot of liquid) on 300ºF and hope it’s tender in 5 hours. Looking for more home cookin’? Check out Beef Stroganoff or Vegetable Soup!